When you buy a KidKraft item, you’re buying a wonderful play land that is made to work with little hands and inspire big imagination. For over 40 years, KidKraft has been manufacturing quality children’s furniture, toys and room accessories that inspire children to play and grow. Their unique and creative heirloom-quality wooden room furnishings and toys are made to be around for years to come. Have you signed up for Joss & Main? They have some deals on Kidkraft furniture & playsets going on now! Be sure to refer your friends too! You can earn $15 per friend! They have daily deals on anything related to home. I just love this site! Even though I rarely buy anything, I love viewing what new items they post each day! Many thanks for spending some time to describe the terminlogy towards the novices! Superb write, I am checking back persistently to discover fresh news. Interesting post. 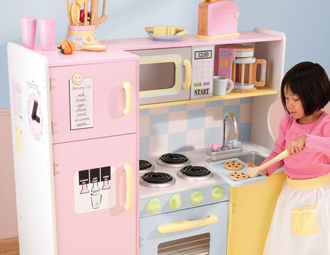 Although the burners on the pictured children’s playset doesn’t appear to be real, does the sink and oven work to some degree?